Talisman: The only talisman that Kodru approves of is under that of fire. Obsidian weapons and armor alike are the only thing that is truly of value to him. History: Under the burning brimstone of flame, Kodru was born an elemental spark in the flames of that brought him to life. As a small ember he befriended a man named Lafuric, a simple blacksmith. Kodru was born as fire, and burned everything around him, sending everything and everyone in flames from anything he could set his fires upon. The only person he wouldn't burn was Lafuric, his creator. Many months later the Lord of the Land came and instructed that this ember be extinguished, that no magical beings should ever exist. As for Lafuric who created him, shall too die for creating such a wild spirit. As soldiers came across to put out the flames and kill Lafuric, Kodru hid inside the furnace and waited for the outcome. Knock Knock Knock ! - The door sounded just before it was busted open by over a dozen Soldiers. They had surrounded Lafuric and asked him "Where is the flame elemental?" shoving him onto the ground and stepping over his hammering hand. "I don't know where he is, he just went up and vanished!" ~Lafuric said before the guards had broken two of his fingers. "Where is it!?!?!" ~ They demanded before putting a knife to his throat. Lafuric hesitated just before he was to speak, he looked into the furnace with tears in his eyes, screaming "Run Kodru, run !". Those were Lafurics last words before he was killed, at that same moment Kodru burned with great intensity, not just for him sitting in a furnace, but in his heart. 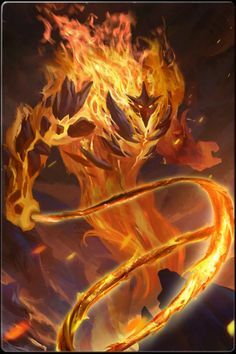 Kodru erupted flame from the palm of his fiery hands, turning everyones weapons and armor into intense heat, cooking them from inside their own protection. From here on, Kodru razed cities, decimated the great armies of the old world, and grew into a unstoppable force to be reckoned with. As he grew in power, so did his manifestation to this world. The more fear there was in his flame, the larger he grew, no simple water could end this elemental. When the world was set in flames, Kodru drew to his utmost powerful potential in its demise, as strong enough to rival the other 4 deities. None had tried to put his flame out, in fear of the burn he may inflict. 500: Flame Blade: Enchants a singular weapon for 2 posts, to cut and burn at the same time, strengthening the weapons damage. 1250: Searing Burn: Marks enemy in the next physical contact and places a fire sigil on them. Target becomes more vulnerable to fire. Lasts 3 posts. 5000: Chaos: Power that enchants the area around him for up to 30 meters, in this zone, no one may use blessings from other gods for 5 posts while they're within this area.